Description: This was a short power transfer consisting of two UP SD40Ns that I saw while railfanning at Santa Fe Junction in KC. Description: This was another shot I got of the two Up SD40Ns going through Santa Fe Junction in KC! 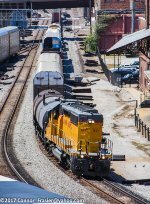 Description: This was a short UP power transfer train I saw while railfanning at Santa Fe Junction, in KC! Description: 40s head up a transfer, rolling east at 1034. Description: Built May 1978 as UP 3479; 1767 built May 1973 as UP 3231.